Help us finalize the name of this new park. At the August 15, 2017 Park Board meeting, the Commissioners reached consensus on a name for our new pocket park at 968 Second Avenue. Read the Park District Naming Policy. Now that the Commissioners have said that Westfield Park is their first choice, you have another 60 days to give us your opinion. 1. 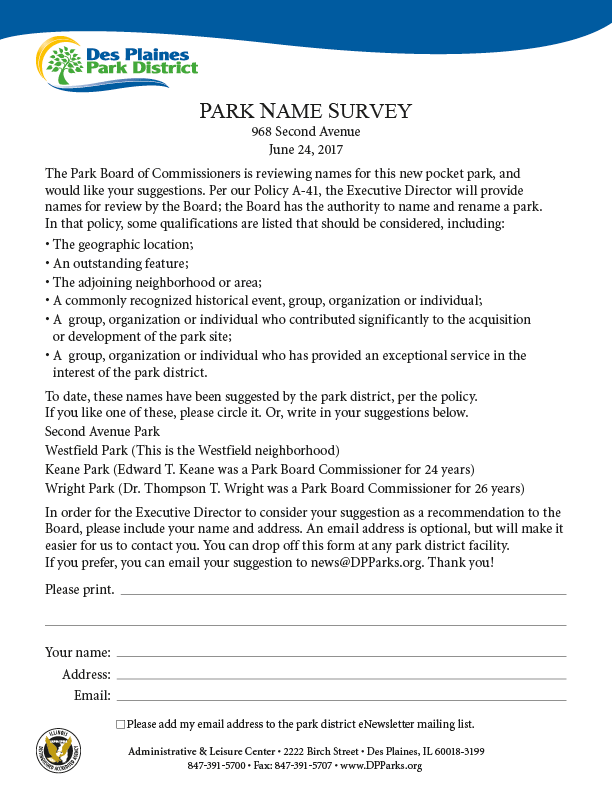 Send an email to news@DPParks.org and tell us if Westfield Park is a good choice, or if you prefer another name. Please include your name and address so we can contact you with any questions. 2. Fill out the Survey form, print it out and drop it off at any park district facility, OR email it as an attachment to news@DPParks.org. 3. Come to Prairie Lakes Community Center or the Leisure Center and fill out the Survey Form. 4. Stop by the Information Tent at Fall Fest, September 15–17 at Lake Park, and fill out the Survey Form. On October 31, 2017, the results will be gathered and then reviewed by the Executive Director. The information will be presented to the Board at the November 21, 2017 meeting. We appreciate your input. Our friends at the Des Plaines History Center have provided us with some facts about the neighborhood known as Westfield. Great thanks to Philip Mohr for the research. The Westfield subdivision was originally opened in 1922 by realtor/banker Walter L. Plew, who called the subdivision Des Plaines Gardens. In 1941, very few lots had been sold, and Westfield Homes (under William Goldman) bought out the undeveloped land and completed the project in the 1940s-50s. “Westfield” was likely a rebranding; we can only assume that “Westfield” means that it was a “field” that was “west” of town. This sort of name was popular within the milieu of suburban development. —The west side of Second Avenue as well as both sides of Webster were initially platted by Plew as Sunset Gardens. Later, the combination of “Des Plaines Gardens” and “Sunset Gardens” were rebranded as “Westfield” to tie with his newer Westfield Estates and Westfield Acres subdivisions. –Westfield Gardens was initially announced as Westfield Estates per this article… There is also Westfield Wolf, the houses on the east side of Wolf between Algonquin and Thacker. And I’ve also seen indications that Terrace School was called Westfield in the planning stages. –Looking over the council documents, Plew was still in charge of Westfield in 1948: this 1948 council minutes also tells us a bit. (Click here to read the Des Plaines City Council document from June, 1948). My conclusion is that Plew held the subdivision and Goldman’s firm was building homes within it. I seem to remember seeing an illustrated ad at one point showing the different “Westfields” under development but I think Plew actually came up with the Westfield name first, though, because Westfield Motors was already doing business (this is the Foremost building now) by 1939; it seems unlikely that the neighborhood would name itself after the car dealer and not the other way around. I remember seeing an article to the same effect, but I don’t have it handy. I’ll send it your way if I come across it.